The short synopsis is that one man starts bringing iPods and personalized music into nursing homes to reach people with dementia. His finds out who they have been, where they worked or what they did in their free time in order to find some music that has a personal meaning to them. When he plays their music for them, there are immediate and profound results. The result is the Music & Memory organization, aiming to bring personalized music to people with dementia. Since the beginning of April, 2015, I have been working with Copenhagen Living Lab (CLL) to bring the Music & Memory program to Denmark. 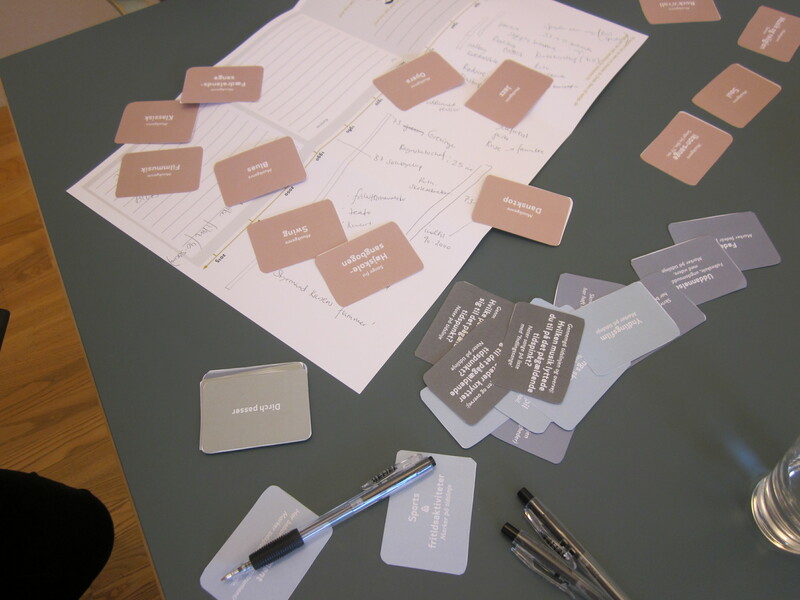 Right now, we are a team of 3 (Mie – a co-founder of CLL and Ethnologist, Louise – a Master’s student in service design who really initiated this project through her studies, and myself – a Gerontologist specializing in dementia). The idea sounds simple enough, get some iPods, talk to people about their lives and music history, and the rest is going to be magic, right? As with most things, it’s not as easy as it seems. 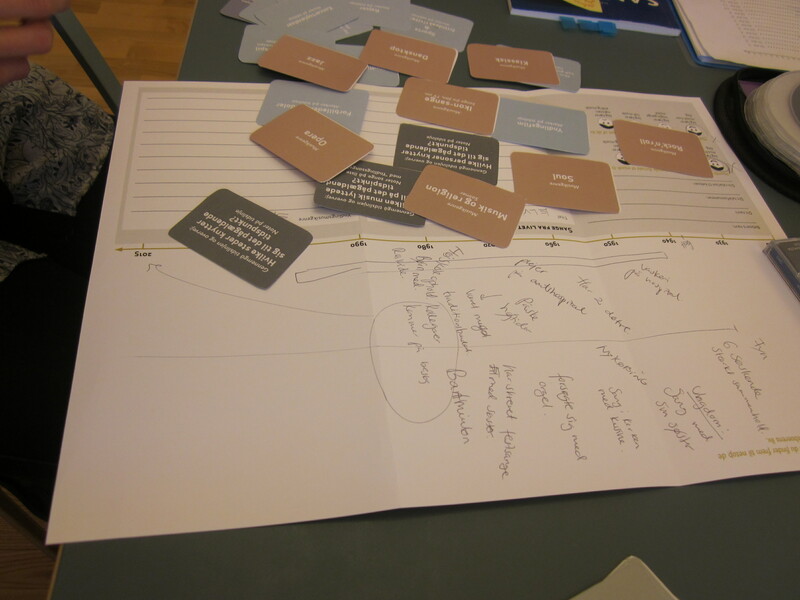 Our first challenge is to figure out the best way to get the information and training to the appropriate people. This means educating the staff at these nursing homes as well as their involved family members and any volunteers we already have available. Our plan is to show the Alive Inside film on Netflix (the only ones with the rights to the Danish subtitles at the moment) as motivation and then go into when are good times to play the music, how to initiate the activity, reactions to look for, how to add the music into iTunes and then on to the iPod, etc. We are also sitting down with them to identify music that is personal to the clients and asking some initial questions that we will follow-up with to try to gauge the effects. Another hurdle is funding. We have partnered up with OK-Fonden‘s association called Livsglæde. OK-Fonden is a non-profit organization that works to improve the conditions and life quality of the elderly, handicapped, and vulnerable groups. They work with nursing home administration, psychiatric services, hospice, and a range of senior and aged housing communities. Livsglæde (means Joy of Life or Cheerfulness) is an association that raises funds to maintain and develop good care for older adults. Their primary purpose is to enhance the enjoyment of life in nursing homes, for the handicapped, and vulnerable groups of people. So, through this partnership, we have some starting funds to buy 8 iPods, headphones, and iTunes gift cards to get started. We also have connections with 2 nursing homes in Denmark where we can start a pilot project, called MusikInMente (Music in Mind). And another hurdle is figuring out who will come in to play the music. Ideally, there are family members who visit the clients in the nursing homes on a regular basis and they could play the music. But, not everyone has family that visits several times a week. And asking the staff at the nursing home to be solely responsible for this is tricky – we would be asking them to take on another task which can easily be forgotten and isn’t in their job requirements. We are looking into getting younger people involved as volunteers. School-age adolescents or university-age young adults would be ideal as we could foster intergenerational interaction and we know that people of this age are going to have more experience with iTunes and iPods so can help to keep the playlists updated and train others as well. For me, there is also the hurdle of cultural differences. As I am not a native Dane, I don’t know a lot of the popular Danish music from before 2005, and especially from before 1950. I also don’t know much about the cultural aspects of music, like the songs they sing as Scouts (comparable to boy or girl scouts in the US – but it is different), or at holidays, or the tradition of writing songs for birthdays and anniversaries. Thankfully, Louise is Danish and has a much better understanding of this than I do. Louise has been working on how the American Music & Memory program could be brought into the Danish context for her final Master’s project. She has a lot of information on how to find out their personal and music history and how to design such a service like this. This week, she and I have gone out to visit our 2 pilot nursing homes and start our training! So far, it’s going well and we are having small successes. We even got a discount at Expert on the headphones when we said we were buying them for a project to bring music into nursing homes! He said they couldn’t give discounts on Apple products (the iPod shuffles and the iTunes gift cards), but he would work with us on what he could. 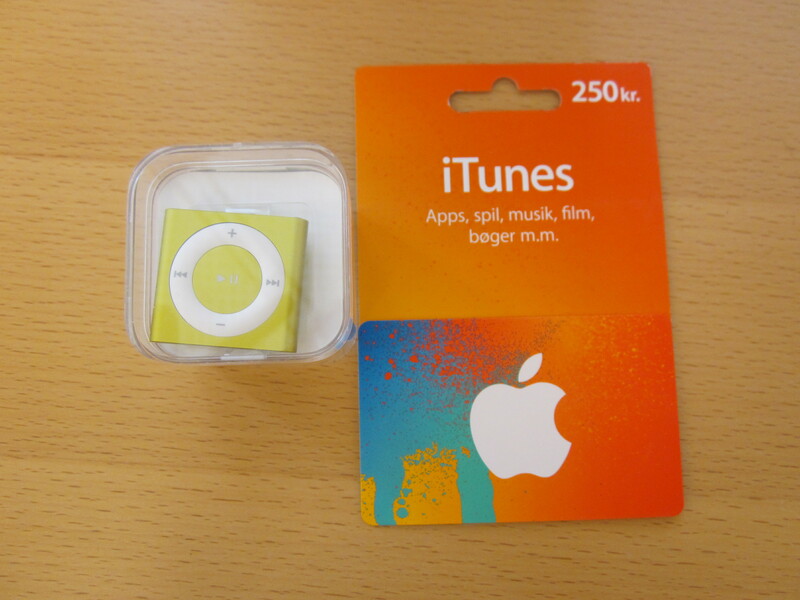 Of course, he still made a good sale as we bought all their iPod shuffles in house (4 at 350kr/$50 each), 2500kr worth of iTunes gift cards (about $365), and all 10 of their Sony headphones at 100kr each (about $15). 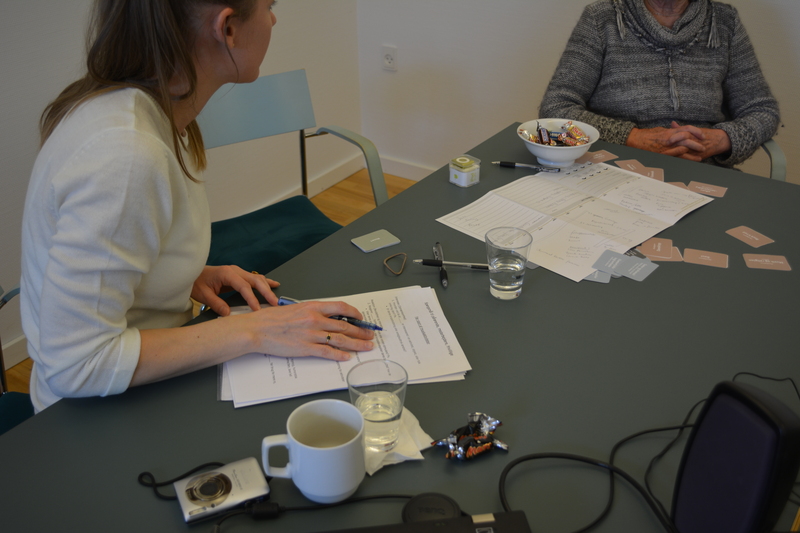 At Dronning Anne Marie Center in Frederiksberg (Copenhagen), we have spoken with the Dementia Coordinator (and former Activities Director) and identified 4 people to participate. We have contacted their family care partners and will start training with them and the staff and volunteers this upcoming week. We have trained 4 administrators or staff members and 2 family care partners at Bæshøjgård nursing home in Vig, Denmark. From spending a few hours there, I must say I am pretty impressed with this nursing home! They have family-style living in a handful of buildings which house 8 people each. In each house, there is a designated staff (day and night shifts) and they have family-style meals together. There is also a main building with a training center (public people can also train there), café, activity area, and the administrative offices. 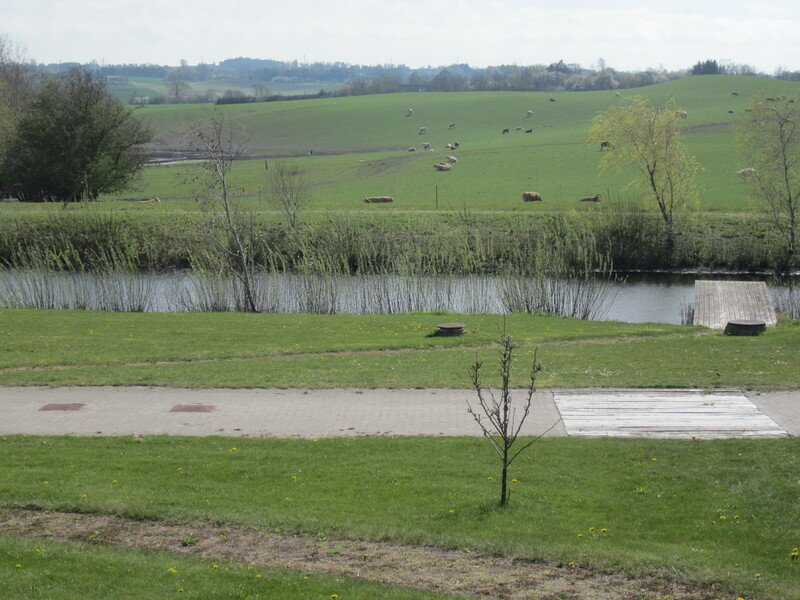 From this dining area, there is a great view of a stream, gently rolling hills, and cows out to pasture. There are also chickens, a few cats, and a few dogs on site. The plan is to complete the training with staff, family members, and volunteers, get the iTunes and iPods up and running, and then come back in about 2 weeks to see how the process went. We know that since this is the first time this is being done in Denmark, we have a lot to learn. So we are hoping to find out what are the ways that do and don’t work to train people, identify music that is meaningful to the clients with dementia, who can come in and play the music with them and how this activity is initiated, and hopefully get some promising responses. Below are my pictures from our initial MusikInMente visits in April, 2015. 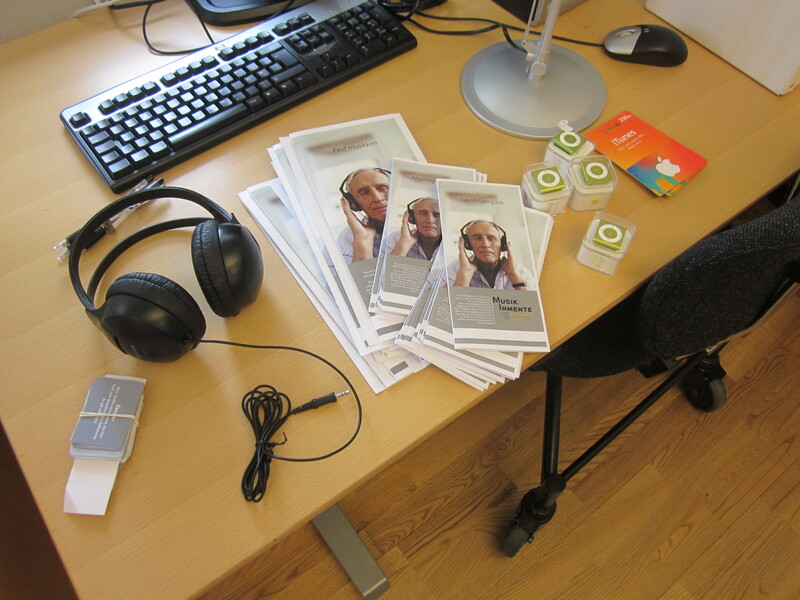 The “music boxes” that will go to the clients – iPod shuffles, headphones, iTunes gift cards, guides, and info pamphlets. Enjoying coffee and cake (with Bailey’s) with one of our clients and his brother – a great way to talk about life stories and music!